Planning to remortgage your house for a new TV? 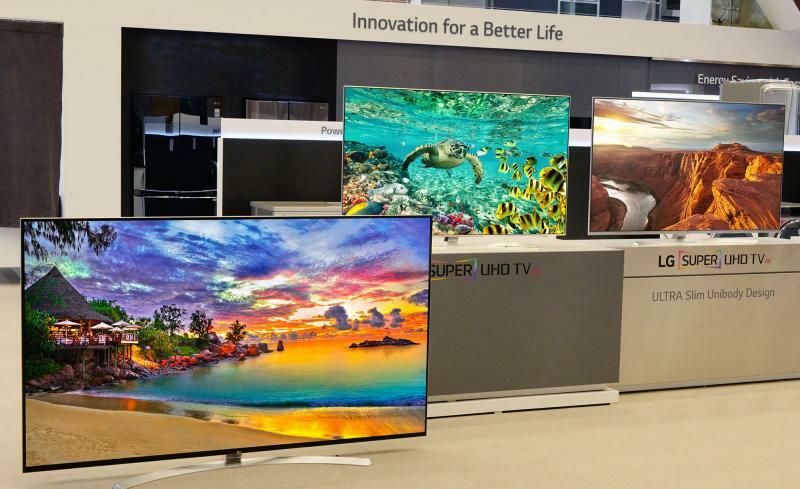 Check out this huge 98in UH9800, it’s the star of the newly rebranded Super UHD TV line-up, which includes plenty of HDR-ready, 4K displays. Perfect for anyone who doesn’t fancy remortgaging their house for a new TV. UH9800 looks set to share the same tech and styling as the rest of the Super UHD range, including support for high dynamic range (HDR) video and an IPS LCD display with True Black panel to minimise reflections. All those pixels won’t come cheap, even if LG isn’t talking prices just yet. Sharp’s 8K set went on sale last September for a whopping US$130,000, so expect something similar for the UH9800. The mainstream stars look set to be the UH9500 and UH9550, super-thin 6.6mm screens with Harman/Kardon tuned speakers that adjust themselves based on where the TV is in a room. They’ve got HDR-compatible HDMI ports and an SDR-to-HDR conversation engine called HDR Plus, which boosts content from any source with HDR-like contrast and brightness. The True Black panel and ColorPrime Plus picture engine should give standard dynamic range footage plenty of punch as well.